Progressive sludge unit LORD DYING has confirmed a North American headlining tour. Scheduled to commence May 8th in Seattle, Washington, the journey will wind its way through more than two dozen cities and come to a close on June 8th in the band's home city of Portland, Oregon. 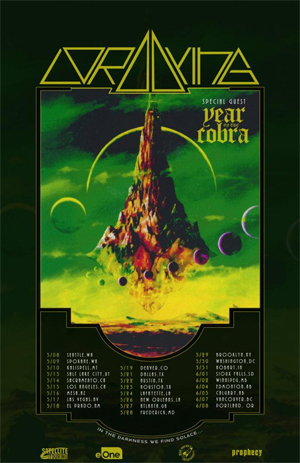 Support will be provided by psychedelic doom duo YEAR OF THE COBRA. See all confirmed dates below. LORD DYING will be touring in support of their impending new full-length, Mysterium Tremendum, set for worldwide release on April 26th via Entertainment One (eOne). Captured at Los Angeles' West Valley Recording Studios in August of 2018 with producer Mike Plotnikoff (FEAR FACTORY, IN FLAMES), mastered by Howie Weinberg (SLAYER, NIRVANA, PANTERA, RED HOT CHILI PEPPERS), and swathed in the striking planetary landscape-inspired cover art of Steve R. Dodd, the band's first full-length in four years is a monolithic, riff-heavy concept album delivering eleven heaving tracks that explore the many facets of dying and what may or may not exist in the afterlife. Emotionally nourishing both musically and lyrically, Mysterium Tremendum's exploration of death goes far beyond the mere longing for it in order to see what lies beyond ("Lacerated Psyche" is about the death of guitarist Chris Evans' sister). There are endless layers to it; you might even find parallels between the record's concept and life itself. It's a journey. And in their quest to pursue death, LORD DYING has themselves found new life. LORD DYING's Mysterium Tremendum will be released on CD, double LP, and digital formats. For preorder options and to stream latest single, "Freed From The Pressures Of Time", visit smarturl.it/LordDyingMT.